Find your way then play! This maze is a great place to play tag or Marco Polo with all the family. Not up to running around? Play by stealth! There’s a viewing platform for calling directions... but who can you trust? 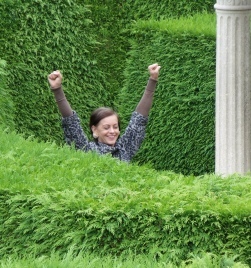 It’s not too difficult to have fun, but if you are up for a serious challenge you should investigate the history of labyrinths at the Museum of Mazes. With myths, maths, mysteries and magic, it’s all hands-on, with puzzles about making mazes. How about a maze with just one path and no hedge? Well, the earliest mazes were never intended to be puzzles for people... they were used as traps for evil spirits. Puzzle mad? Puzzle Shop! Yay! We have wooden puzzles, metal puzzles, tavern puzzles - all the best puzzles in the world. They make great gifts for the people you love... and some make great gifts for people you don’t! 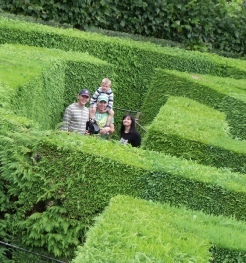 Discounted tickets including the Wye Valley Butterfly Zoo are available, and Wye Valley Miniature Golf rounds at half price when you visit the aMazing Hedge Puzzle. The maze is in the Wye Valley at Symonds Yat between Ross on Wye and Monmouth and a great walk from Forest Holidays in the Forest of Dean.